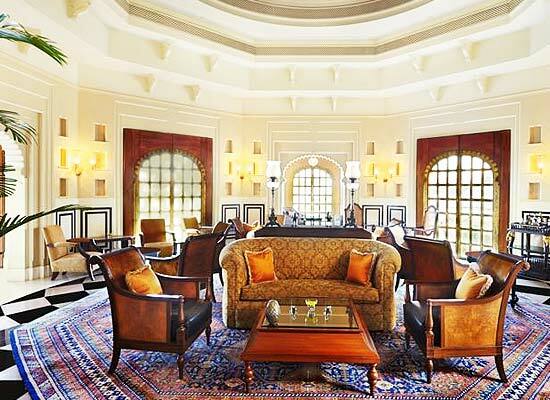 "Oberoi Udaivilas, located on the banks of Lake Pichola, is the finest heritage style hotel in Rajasthan. 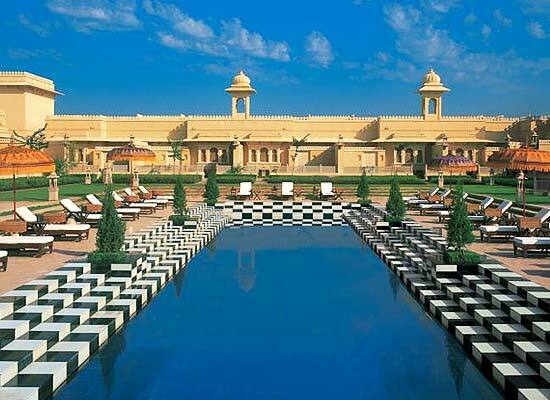 The guests who stay in here are swooped in the romance and the splendor of the Royal era of Rajasthan. The glorious structure of the hotel thrills and chills even the harshest of hotel critics. The luxury and comfort offered in this hotel make one's stay really unforgettable. 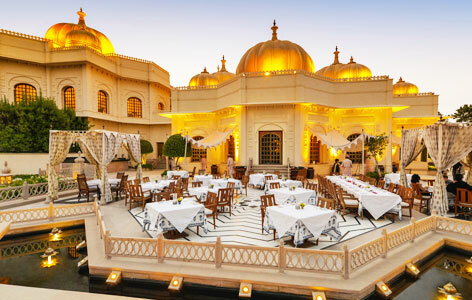 Oberoi Udaivilas is a newly built heritage style hotel of India which provides a stay in an environment that truly reflects the colors and heritage of Mewar region of Rajasthan. 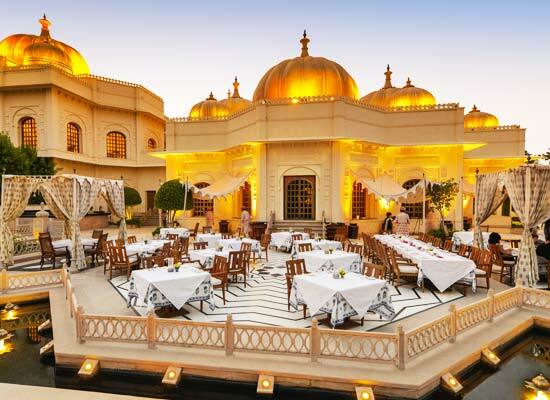 The rambling courtyards, serene fountains and lush green gardens are the best feature of traditional Mewar architecture which is portrayed in this hotel. The hotel is surrounded thoroughly with traditional and stunning wall frescoes. 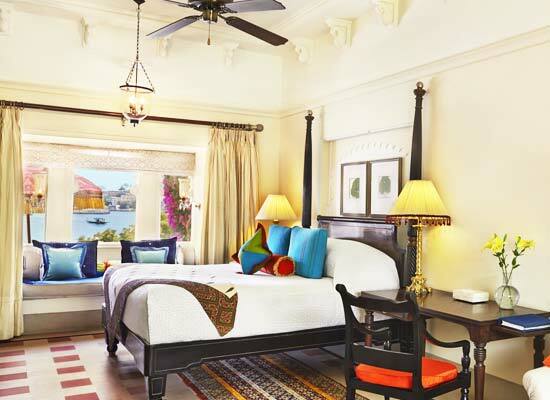 Premier Rooms: The basic luxurious rooms showcase the charm of Indian textiles and traditional handcrafted furniture. Premier Pool View Room with Private Courtyard: These rooms offer an additional Courtyard to enjoy the sceneries. Also one could see enchanting views of the hotel’s pool from here. Premier Room with Semi Private Pool: These rooms have an additional small private swimming pool. Luxury Suite with Private Pool: This suite offers magical sights of the City Palace, Aravalli Hills and Lake Pichola. Kohinoor Suite with Private Pool: The best room of the hotel offers what Udaipur is famous for: provides an ideal romantic getaway. Udaimahal: The guests enjoy delicious Indian cuisines mainly comprising of Rajasthani and Punjabi delights. Suryamahal: This international cuisine restaurant delights one and all with Thai, Western and Mediterranean flavors. Chandni: Come here to enjoy fine dining and wining amidst lush green courtyard while listening to folk music. Bar: For relaxation, guests come here to enjoy refreshing wines, cigars and spirits. Udaipur is popularly called as the “Lake City of Rajasthan”. The beautiful Indian tourist destination in Rajasthan is located on the banks of tranquil Lake Pichola. The city was founded by legendary Maharana Udai Singh in 1559 A.D. The city is so stunning that it has been a source of inspiration for numerous renowned poets, painters and artists from all across the world.